Please note the office is closed Wednesdays. 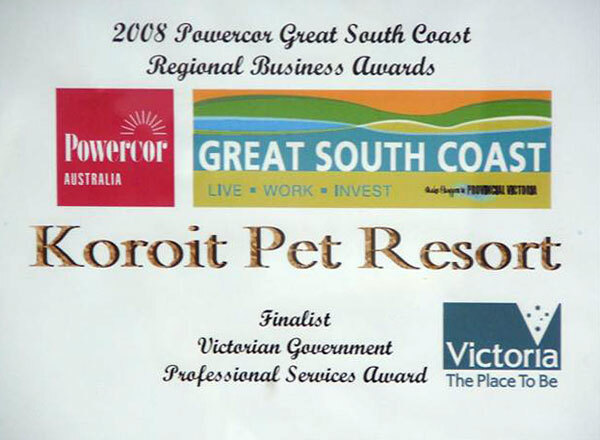 Koroit Pet Resort is conveniently located only 15 minutes from Warrnambool and Port Fairy. Just follow the Koroit Pet Resort signs along the Princes Hwy. For detailed directions, please contact Josee. of DogzOnline.com.au, Australia\'s purebred dog community. We are also members of Dogs Victoria and the Feline Control Council of Victoria. For more information, please contact Josee. View Josee & Ricki's certificates here.